One for the tonehounds, we reckon, and if that's you, just remember it's a time-limited model. This year may have seen Martin focus on its 100-year-old dreadnought, but in terms of new releases we've seen plenty of other styles. Launched towards the end of the year, along with a pair of dreads - the DR Centennial and D-15 Special - the 000-15 Special is a seriously stripped-down, vintage-y tone machine that's only available in a limited order window. Our all-acoustic review model is joined by an electro version (at £1,635); both include a hard case. Martin's 15 Series is, of course, all-mahogany, so this one breaks the rules with its Sitka spruce top, hence its 'Special' title. Price-wise, it also sits very slightly above the 000-15M (£1,399), but below the spruce/mahogany 000-16GT (£1,529). In terms of spec, it's identical to the 000-15M, with the exception of its black edge binding (which contrasts the untoned spruce top) and a single black back-stripe. These subtle changes impart a crisp modernism to the Special as opposed to the blues vibe of the all-mahogany model. However, its open-gear butterbean tuners, bone nut and compensated saddle add a more vintage vibe, as do the subtle abalone 'diamonds and squares' inlays between the 5th and 9th frets. Like the other 000s below the Standard series 000-18, we get the longer Martin scale of 645mm (25.4 inches), with the narrower 42.9mm nut width and 54mm spacing at the bridge. Bracing is non-scalloped like the 000-15M. Beautifully lightweight and, of course, slightly smaller than a dread, with its slimmer 105mm depth, there's instant engagement here, which is amplified by the mainstream modified low-oval profile neck with its standard taper. Its Plek'd frets and setup are roomy, though the fret tops could do with extra polishing until they burnish in with playing - but intonation is excellent. As many players have found, tracking a guitar like this over a similarly spec'd dread gives a little more sheen, even for simple rhythm beds. To generalise, a 000/OM's voice doesn't have the depth of a dread and that's the case here in comparison with our 16 Series spruce/mahogany Martin dread. The Special sounds 'cleaner' with more clarity that suits arpeggiated styles, especially with pick and fingers, and drop and open tunings. And as many players have found, tracking a guitar like this over a similarly spec'd dread gives a little more sheen, even for simple rhythm beds. It's a 'new' sound, too; playing will no doubt round out that brightness in time. Of course, it's a different tonal texture compared with the all-mahogany 000-15M, and 'prettier' with less hardwood-top-like compression compared with a mate's well-used 000-15M. 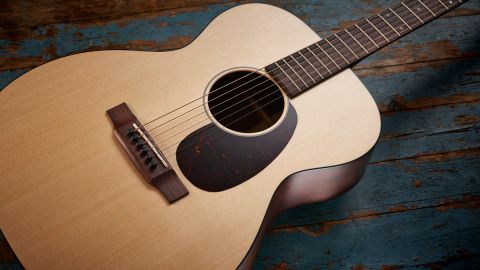 For the player wanting a Nazareth-made modern spruce/mahogany 14-fret 000, the starting point is really that more costly 000-16GT, but the price shavings here might well appeal, especially considering its thin satin finish and its rosewood fingerboard and bridge, as opposed to the 000-16GT's Richlite.